It’s been a week now since the first day of summer and the heat wave is hitting us with all its power. This weekend are supposed to be 102F. Boy, that’s hot! Even tho the heat keeps me away from the kitchen, I still can bake. Somehow, my ovens don’t heat up the kitchen, like my stove does. So I bake. Almost everything. Even the salad. You may think I’m making fun of you and that’s not possible, but it is. 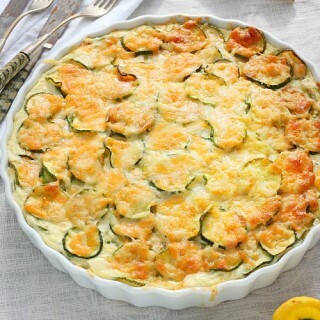 Very possible and very delicious! And perfect for Jen’s June bootcamp – salads! 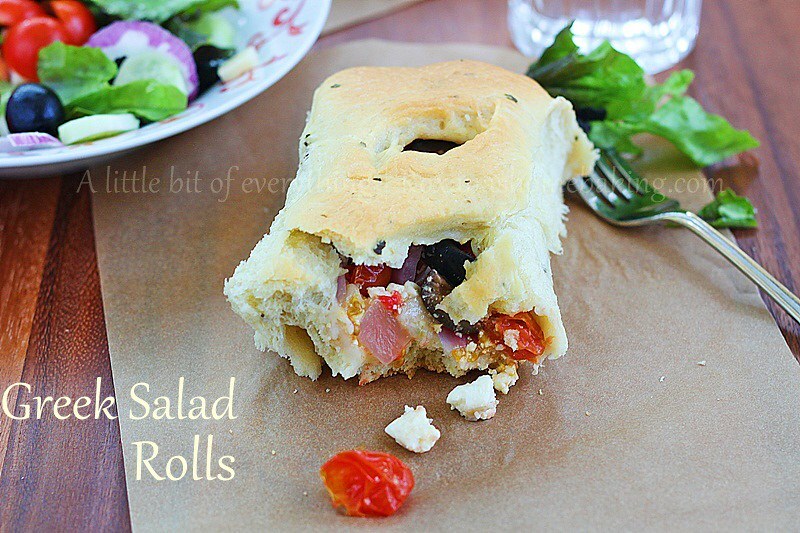 I gathered most of the ingredients found in one of my favorite salads, Greek salad – tomatoes, olives, onion, feta cheese, olive oil, oregano – and turned them into these delicious rolls. For the dough, i slightly adapted my olive oil rosemary bread using bread flour for a softer fluffier bread, and oregano instead of rosemary. After the dough is risen, I flatten it out, filled it with tomatoes, olives, onion and feta cheese and waited patiently until I took them out of the oven so I can do some taste-testing. The rolls turned out better than I expected. The bread is soft and the filling cooks nicely while baking. 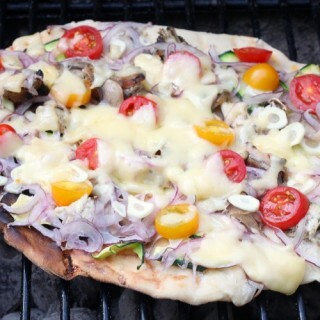 The tomatoes and the onion soften, the olives and the cheese keeps its salty sharp taste. Was the perfect dinner on a weeknight. The rolls are best eaten when warm. We had one left for the next day, and heated up for few seconds in the microwave. It was good, but not as good as the night before. 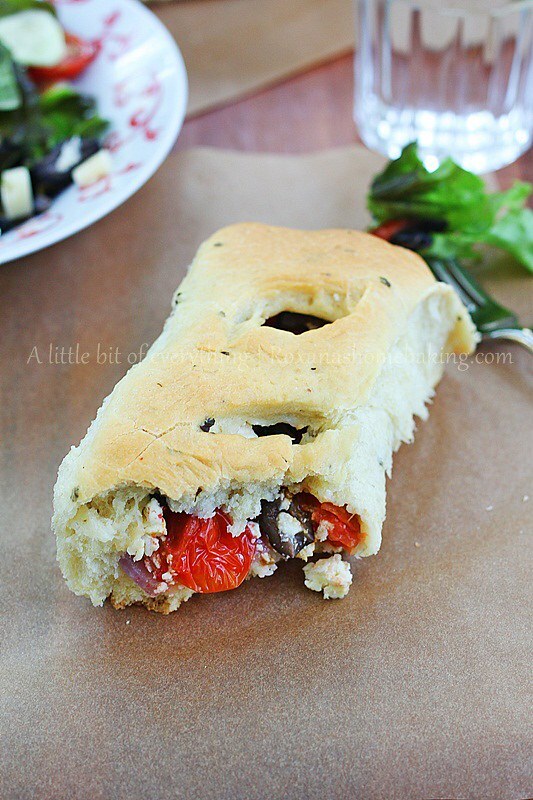 Flavorful olive oil bread filled with tomatoes, onion, olives and feta cheese making a delicious weeknight dinner. In a mixing bowl sift the flour and make a well in the middle. Pour the water and sprinkle the yeast on top of it. Let it rest few minutes at room temperature until the yeast dissolves and foams. When bubbled, with the dough hook on, add the olive oil, salt, oregano and egg and start mixing slowly adding enough water to make a soft bowl that cleans itself from the sides of the bowl. Let it knead for 3-5 more minutes. Alternatively, if you’re kneading by hand, add the egg, oil, salt and oregano in the middle of the flour. With a Danish whisk, start mixing the flour mixture, slowly adding enough water to form a ball. Take it out of the bowl, and on a lightly floured working surface, knead the dough for 10 minutes until soft and elastic. Place the dough in a oiled bowl, cover with plastic foil and leave at room temperature until it doubles in volume. Punch down, knead for 1 minute and divide the dough in 4 balls. With a rolling pin, flatten the dough in a 8X8 inch square. Place a little bit of the tomatoes, olives, onion and feta cheese on one side and with the other cover and seal to make a pocket. Place the roll/pocket with the opening side down (to make sure it doesn’t open wide while baking) in a 11X7 baking dish and cut three-four openings in the dough to let the veggie steam get out. Do the same with the remaining 3 rolls. Cover and let rise again for 20 minutes. Meanwhile heat the oven to 400F. When the rolls are puffed again, lower the oven temperature to 375F and bake them for approximately 30 minutes. Let cool slightly in the pan before removing. These rolls are such a clever idea! I love Greek salad so I know this would be a favorite too...they're full of fresh flavors and definitely the perfect summer meal! That is really creative! 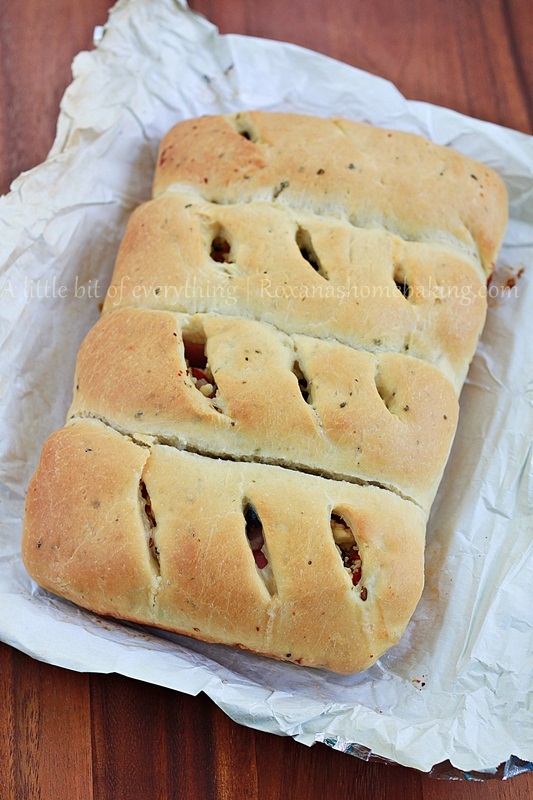 I love how you put little slits in the dough to make it look beautiful. I want so badly for there to be a Roxana's Bakery so I can go there and try all your amazing creations. These look so delicious! 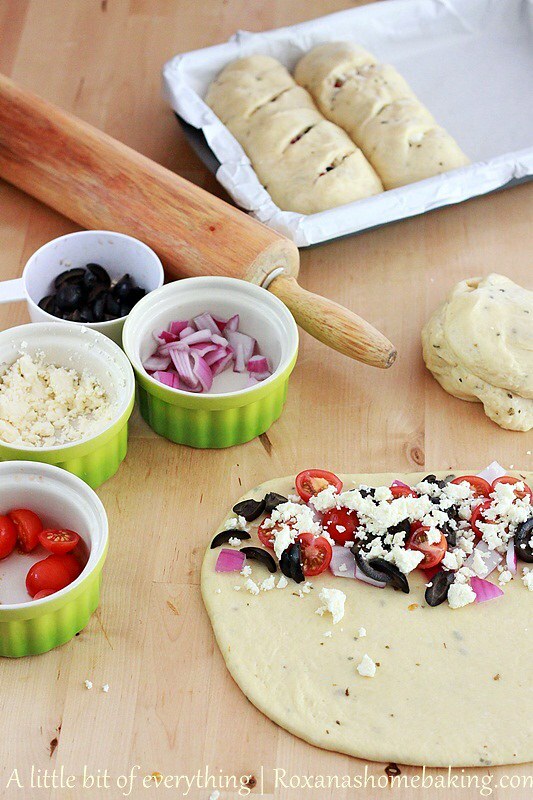 I love Greek salad and the olive oil dough sounds like the perfect accompaniment! These look gorgeous! I love this idea! You could switch this up so many different ways. Great idea! YUM! 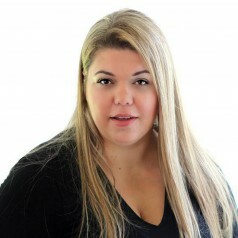 This surely would have made for a fantastic mid week meal, Roxana! We had today 106F, and for the rest of the week they are saying it will be up to 108F...Super hot! 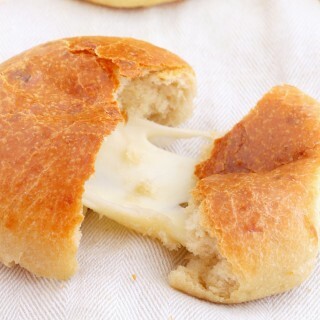 On the other note those rolls look HOT too:)) Very delicious and beautiful pics! What a clever idea. My mind is racing with all the different things I can do with this idea. I believe that you bake everything even salad! This looks really good especially the heat where you live. Where I live is still cold. Boo! I need some sun and heat..badly. 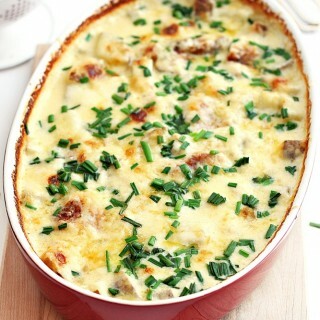 I wanna make this right now ! 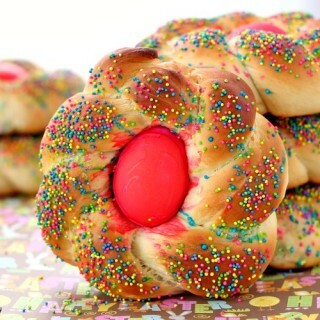 Roxana can I omit the egg in the dough. Hi Shivani, You can leave out the egg in the dough, but you have to pay attention to the water. You may need a little bit more. A salad in a bun! What a clever and creative idea. They look fabulous. These look really cool, I've never seen this combo in bread but it look delicious. 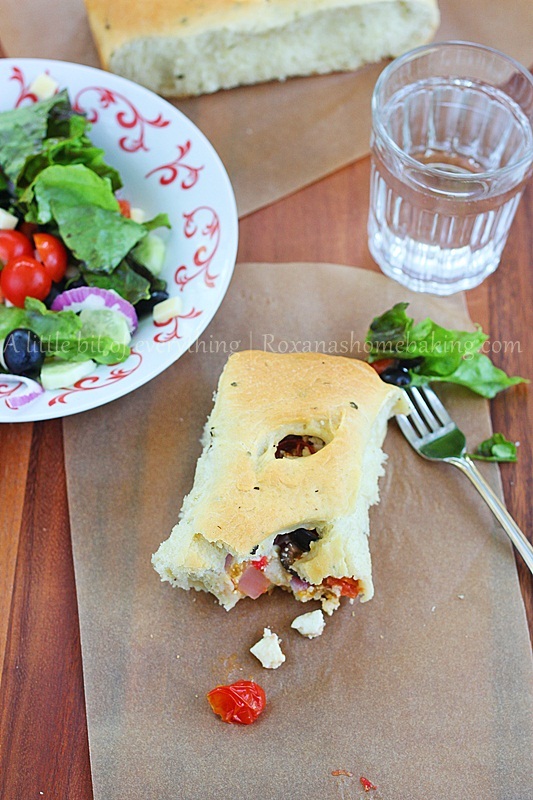 Oh, what a wonderful idea for the salad-bread combo! You get a bit of everything with each bite! This looks gorgeous! So many of my favorite flavors. What a smart idea and love that you did it with a greek salad. 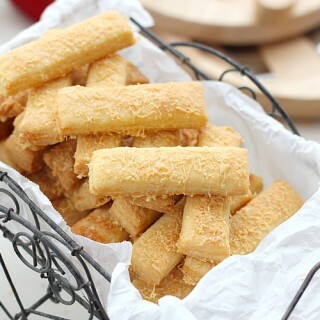 Easy to eat and delicious!! What a great idea. 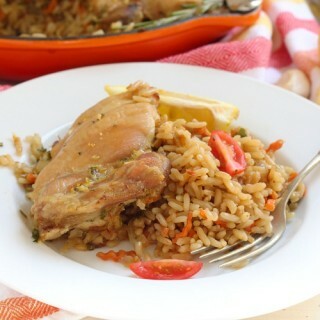 I am pinning this and trying out that bread recipe too! I love greek food and its flavors, and can never resist anything that has feta cheese and red onions in it. These look GREAT!